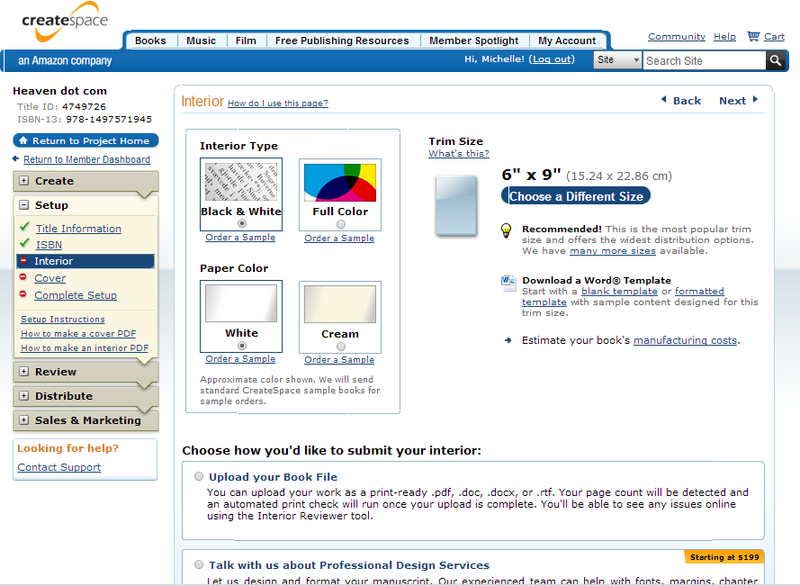 This post will cover uploading the interior file of you book to Createspace. For help with setting up your account, and starting a new project, please check out Part 1, Part 2 and Part 3. The first part of the process for the interior looks like the image below. You need to choose the Interior Type, either black and white, or full colour. If you have any images at all inside the book that you want in colour, you will have to choose full colour, and it is much more expensive than black and white. Then you need to choose the Paper Colour. I have only ever used white for my own books, as cream wouldn’t go with my covers. But I have had clients who have chosen the cream and have been very pleased with it. Next, is trim size. 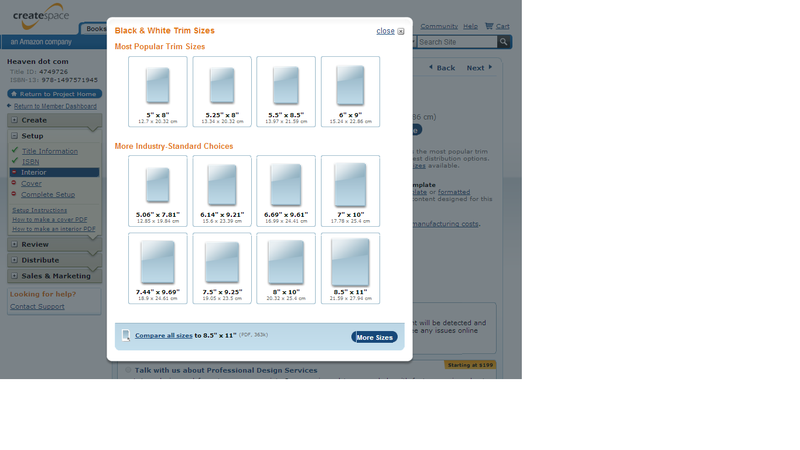 Createspace offer many different sizes, which you will see when you click on Choose a Different Size. For my Earth Angel Series books, I use the 5.5″ by 8.5″, mainly because I used to publish them elsewhere and this was the only size they offered. When I switched to Createspace, I kept the same size. But when I had the covers of the Visionary Collection re-designed, I decided to switch to a smaller size, more appropriate for a novel, and the smallest size that Createspace offers – 5″ by 8″. It’s entirely up to you what size you use, but bear in mind that with Print on Demand, the cost of the book rises with the number of pages. So if you have a 100k word novel, and you choose the smallest trim size, you will pay more in manufacturing cost than if it were a bit bigger and fewer pages. At the other end of the scale, if you have fewer pages, and you want the book to look more substantial (and you want writing on the spine) then go for a smaller size. 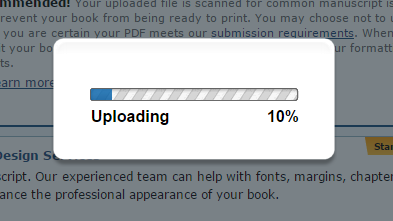 Once you have chosen the trim size, you can click on Upload Your Book File. At this point, I am assuming that you already have your book file properly edited, proofread, formatted and laid out in the correct way. You can upload a word document, but I prefer to upload PDFs, so that my formatting isn’t changed in any way in the process. If you haven’t got the book file ready to go, then you can just save your choices so far, and come back to this stage later. 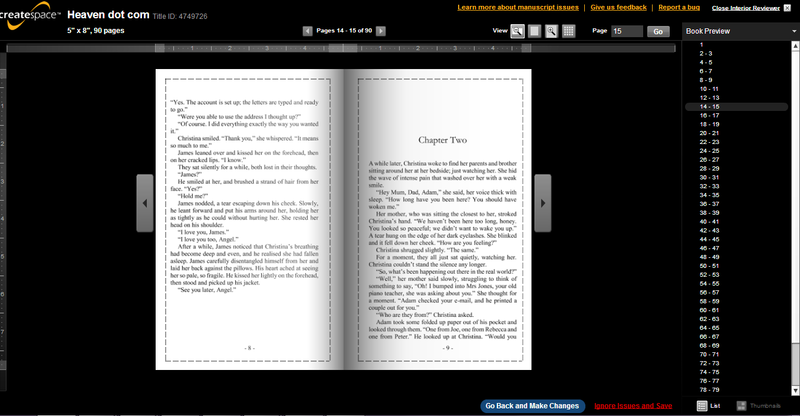 I will be posting a series on how to format your book for print very soon. 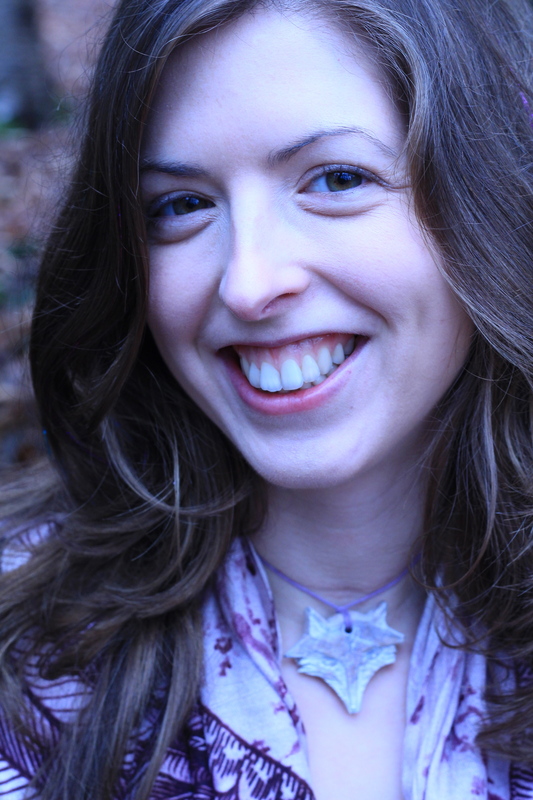 Once you have chosen your file, if it’s a PDF, you will be asked if the bleed ends before the edge of the page, or after – I always choose before to ensure nothing gets cuts off. 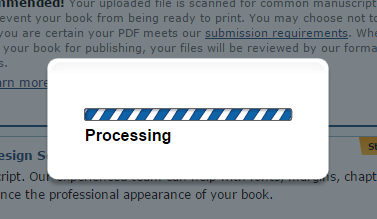 Then, click on Save, and there will be a bit of processing time, and then they will perform the Automated Print Check. 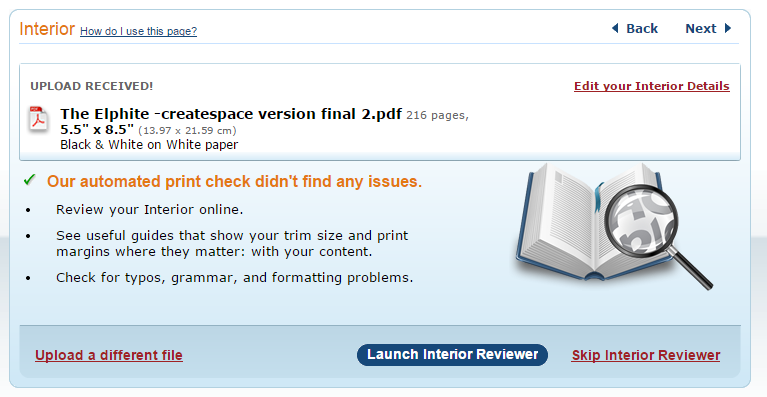 If there are any issues found, it will tell you, but even if it says there are no issues, you still need to click on Launch Interior Reviewer, to go through the book carefully, to make sure that how it is presented in the Reviewer is EXACTLY how you want it to be printed. You want all of your text to be inside the dotted lines (if it isn’t it will tell you anyway) and you can go through, page by page, to make sure all is in order. If there are any issues but you accept them (like a low resolution images) then you can click Ignore Issues and Save, when you are happy with how it looks. Or if there are no issues and you are happy with it, you will click on Save and Continue. If you do find anything that you need to change, you will have to go back to your original document, make the changes, export it as a PDF again, then go through the upload process again. To do that, you would click on Go Back and Make Changes, then click on Upload New File. You can go through this process as many times as you wish to get the interior to look the way you want it to. 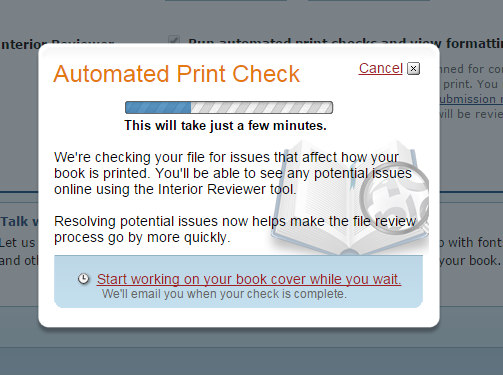 When you exit the reviewer, you will then click on Save and Continue, and you will then go onto the next step, which is uploading your cover. I will cover that step in the next part of the series! If you are finding these posts useful, please do comment below and share them with fellow writers and authors!